Just expand the 4 leg strings and put the plant pot in the middle of the conjunction, it is very easy to use. 3 different sizes (large/middle/small) are suitable for most flower pot shapes and sizes. Just expand the 4 leg strings; put the plant pot in the middle of the conjunction, our 3 different sizes plant hanger can fit a variety of flower pot shapes and sizes. Ideal for flower pot from 4" up to 8" in diameter. 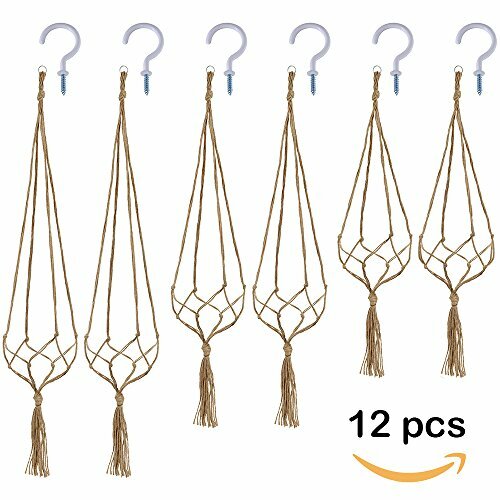 6 Pcs 2 Inches Ceiling Hooks Can help to hang these rope holder.